We have completed testing our latest update of Norton Antivirus, Norton Internet Security, Norton 360, and Comcast Norton Security Suite 21.2.0.38, and have released the update. To download it, simply run LiveUpdate. This update is available in all languages. See the below FAQ for details. A reboot will be required for Windows XP & Vista customers, however no reboot will be required for Windows 7 or Windows 8 customers. The version number is 21.2.0.38. 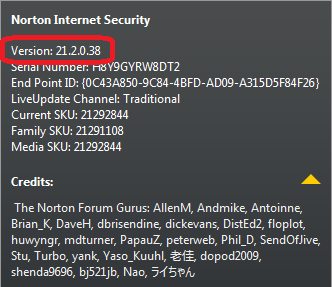 Please note that all Norton Internet Security, Norton AntiVirus, Norton 360, and Comcast Norton Security Suite customers running version 21.x with a valid subscription will receive this update for free. Not using the new Norton products? See if you qualify for a FREE update to the newest version of NIS, NAV, or N360 by visiting the Norton Update Center. Comcast Norton Security Suite customers should visit the Norton Security Suite download page. This update is now available via LiveUpdate in all languages. - Toolbar enhancements - Toolbar Settings Panel, enhanced infobar for multiple logins. - Resolved issue where Norton 360 Online Backup displayed "Failed - New Files Backed Up: 0"